CHANGING THE DOGS, BY CHANGING THE OWNERS. When Vladae talks humans and dogs listen. Vladae says to his typical client, "Listen Mary, your Fluffie's behavior is not going to change. You have to change yours to fulfill your dog's needs." 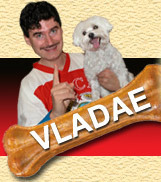 While other high profile trainers and behaviorists focused on trying to fix the dog, Vladae's first order of business is to fulfill the dog's needs and change the people. "In a lot of cases the dogs are not the major problem," says Vladae. "It is the owners who have to change and that is the hardest part." Vladae is part marriage counselor, parental counselor, police officer, and analytical FBI agent. He helps his clients by helping them help their dogs, and like any healthy relationship it enriches the lives of all.